My thoughts on Daniel Bromley’s critique (1): Is open access the problem? In 2008 Daniel Bromley gave a keynote lecture at the biannual conference of the MARE Centre in Amsterdam where he strongly criticized economists for giving flawed adivce to policy makers (to use the more polite terms). The conference organizers must have had a hard time finding an economist willing to write a reply to his lecture, because they even contacted me – I chickened out. I felt I hadn’t been working on fisheries issues long enough yet to have a well-founded opinion on Bromley’s writings. Shortly after his keynote lecture, he published an article in Fisheries with a central message similar to that in his earlier keynote, but phrased in stronger terms – and with a lot more impact. In his Fisheries article he took a few arguments further to the point where just about every economist I know disagreed wholeheartedly (again, I’m being polite here). I discussed it with some of them, and with other fisheries scientists. I also discussed it in class once, but the students, most of whom were no native English speakers and had little economics background, had serious trouble with Bromley’s rather difficult use of vocabulary. Lately, after coming across other work written by Daniel Bromley (and his co-author, Seth Macinko), I started reading these two articles again. Although I broadly agree with the mainstream economic analysis of fisheries management, I got the impression that perhaps he has been misunderstood by my fellow economists and it would be a shame if his ideas were ignored because of the impression his Fisheries article made on most economists (again, to put it politely). I decided to put my thoughts on his criticism of fisheries economics in a few posts. Private property (I believe this should be res privata but my Latin is pretty non-existent): an individual owns the resource and has the right to manage and use it as he or she pleases. If you look at it this way you see that most fish are caught within the Exclusive Economic Zones of individual countries; in fact, only one sixth of global catch comes from the high seas. Within the EEZs aquatic resources are either private property (for example, oyster and mussel fishers own parcels, which they seed, and they have the exclusive right to harvest them) or state property (with regard to most fish species, the government sets the rules on how much to catch, and with which methods). So strictly speaking, open access is more an exception than a rule. This doesn’t mean, however, that the open access regime is irrelevant to our understanding of fisheries problems. By looking at fisheries under open access, we lay bare the mechanisms that make fisheries policy so difficult: the individual fisher reaps the benefits of catching one more fish, whereas all fishers bear the costs to the resource, i.e. the future productivity lost because the fish is in the basket instead of the sea. In theory, state property regimes are able to deal with this problem as governments can exclude people from fishing. In reality, however, governments have problems of their own that prevent them from keeping in check the forces that lead to overfishing: many fish stocks are shared by several countries, there is lobbying by special interest groups, rent-seeking, and so on. It’s like Hobbes’s Leviathan (named after a sea monster! ), which starts with how unrestrained human nature leads to a war of all against all, and then explains how this restraining of human nature should take place. To understand the regime you also need to understand the forces it is supposed to rule. Another confusion, by the way, is that between open access resources and common property resources. The confusion started when the American ecologist Garrett Hardin wrote his Science article named The Tragedy of The Commons, where he explained how common lands will inevitably be degraded because the individual land user reaps the benefits of an extra sheep while imposing the costs of overgrazing on all users. Daniel Bromley has repeatedly argued against this article and I understand why. The problem is the choice of words: commons. Commons are owned, managed, and used by an exclusive group of users who have every possibility and motivation to make good arrangements and stick to them. In fact, researchers like Elinor Ostrom found that many commons are managed quite well. The “Tragedy” that Hardin describes takes place in open access regimes, like the high seas. Unfortunately the confusion is still omnipresent: just this week The Economist refers to the Tragedy of the Commons to discuss the problems with high seas fishing. To me, this underlines the importance of defining your concepts well, and being wary of oversimplification. It’s too easy to use the broad brush of open access to paint all problems with resource overexploitation. We need to get into the details to really understand the matter. How are rights, priviliges, obligations, and such distributed? How do they work on paper (de jure) and how do they work in practice (de facto)? How are things like decision-making, monitoring, and enforcement organized, and what resources do they need? What is the role of official laws on one hand and unofficial norms and customs on the other hand, and where do they contradict? I feel that these questions have been overlooked in the debate that was unleashed after Bromley’s Fisheries article. Warning: geeky post. It’s got math in it. I remember reading the course’s textbook on discounting and thinking: this is madness! Looking back at that moment, and at the literature that has evolved since, I feel vindicated. I was right. People are impatient: they care less about things they need to wait for. My objection was that we use the same formula to describe both the interest on your bank account and the psychological phenomenon that I don’t like to wait for nice things (but I sure like to postpone nasty things). How can we be sure that our brains work the same way as a bank account? From what I learned later I gather that economists prefer to use a single variable r to capture both effects because it is easy, and because it induces time consistency in the choices based on discounting. If capital markets work well, the market interest rate should give a good reflection of people’s pure time preference as well as their expectations of the returns on their investments. As regards consistency, assuming a fixed discount rate for every year fits neatly in the omnipresent assumption that people make rational choices: if you are indifferent between €100 now and €105 next year, you are also indifferent between €100 in 2030 and €105 in 2031. But this is where things get awry – and where I get my bit of vindication. It turns out our brains don’t work as neatly as the formula suggests: we are all, to a greater or lesser extent, time inconsistent. Behavioural experiments have shown that people apply what is called hyperbolic discounting: they apply higher discount rates to the near future than to the distant future. If you tell me you are indifferent between €100 in 2030 and €105 in 2031, and I ask you again in 2030 whether you would rather have your €100 now than to wait a year for an extra €5, it is likely that you will ask to have your money in 2030 (which would by then be the present). Interestingly, hyperbolic discounting is one of the explanations for addiction in the behavioural psychology literature. Anyone who has been a smoker recognises this: you don’t want to be a smoker all your life, so you set a date for your last cigarette. Then when the time comes, you’re “not ready for it yet”, or “this is not the right time”, or you think “aah, just one for the road.” So you keep smoking. And years later, when you look back on all those years coughing, smelling, getting your fix in the rain, and spending all that money, you regret not having kicked the habit earlier. If that isn’t time inconsistent, I don’t know what is. No musical instrument illustrates the yearning gap between classical music and traditional music like the four-stringed wooden box I’ve been playing for the last 13 years. It starts with the name. Ask me what I play, and I would tell you I play the fiddle; ask a classical musician what it is I play and he would say “violin”. But really, it’s the same instrument. (Admittedly, this only applies to English – the Dutch call it viool, no matter how you play it.) I sometimes meet violinists (that is, classically trained musicians) who approach traditional music as a simple sort of classical music – a subset of classic, to use a mathematical term. If you can play Paganini‘s works, sure you can play The Maid Behind The Bar, right? Wrong. They’re totally different paradigms. Different worlds. It’s almost like you’re playing a different instrument. And let me be blunt: a classical training is a serious impediment to playing traditional music. It starts with the fact that we know the composers of almost all compositions in classical music, but most tunes in traditional music have composer “unknown”. The composer of a classical piece still owns it, as it were. Change the notes and it’s not the same piece anymore; even worse, it would be disrespectful, like painting a mustache on the Mona Lisa. Yes, classical musicians interpret the music they play in their own way, through the intonation and the dynamic they (or the conductor) choose. But they must stick to the written music. On the other hand, apart from recent compositions, traditional music is public property. In fact, part of the fun of playing traditional music is the freedom of interpretation: let’s put in some more syncopation by playing these notes a bit differently… Did you know that this tune sounds great when you play it in a minor scale? If I bind those notes and skip these it sounds really great on the fiddle. Also, there are often many versions around of the same tune. Second, traditional music was originally developed to accompany dancers, so the most important element of it, high above the rest, is the rhythm. You can be a virtuoso all you like, it don’t mean a thing if it ain’t got that swing. Classical music, on the other hand, remains a work of art, strongly associated with the composer. So all facets, including melody, harmony, and arrangement, are to be appreciated, and rhythm is usually not the most important part of it. Third, a classical training starts with reading music, whereas a good workshop in traditional music teaches the tune by ear. Let me be even clearer on this. I know a musician who took classical music lessons as a kid and she told me her father would slap her if she gave only the slightest hint of playing by memory rather than from sheet music. 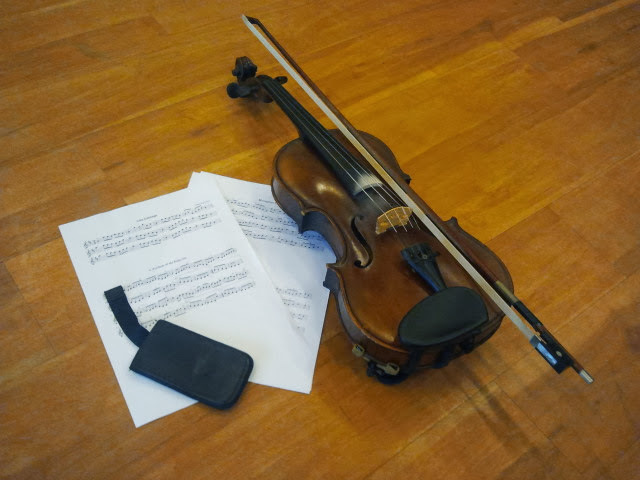 On the other hand, in most fiddle workshops people have recorders with them (mobile phones, nowadays), and the teacher distributes sheet music only at the end of the workshop, if at all. This will sound mean to you if you are a classical musician, but every now and again I meet violinists who cannot learn a tune by ear, and even if they know the tune they still cannot play it by heart. Like barrel organs, they’re lost without their sheet music. So kids, when you want to learn to play music, stop reading it. I usually emphasize in my lectures that you should strictly distinguish policies from scenarios. Policies are what we choose; scenarios simply describe what might happen, regardless of what we choose. In practice it is not as clear-cut as that may seem. In any environmental economics textbook you will find different possible rules to choose between policy options under such uncertainty. Perhaps you want to minimize the possible losses from your policy. By such a maximin rule, as it is called, you would ignore the best outcomes and focus on the worst ones. So you choose Policy 2 because the worst that could happen under Policy 2 is that you lose $50 where under Policy 1 you could lose $100. It is also possible that you want to get as much as possible out of your policy. By following a maximax rule, where you ignore the worst outcomes and focus on the best ones, you would go for Policy 1. After all, Policy 1 could yield $100 where Policy 2 can, at best, yield only $80. And there are more decision rules. Every year I see students, when asked exam questions like the problem above, give answers like “I would choose Scenario 1”. Which is why I keep emphasizing: you don’t choose scenarios. Nature chooses the scenario. Or God, or Fate, whatever you want to call it. But not the policy maker. But now comes the tricky part. Suppose the policy maker cannot choose all possible policies at once. Perhaps she works at some government department that decides on some policies, but there are other policies that are decided by other departments. Or the effect of her policies depend on what other governments do. We’re having discussions about this all the time in VECTORS. For example, an Environment Ministry might want to evaluate a ballast water treatment policy to combat invasive species, but the effects of the policy also depend on international trade policies which are decided by the Ministry of Economic Affairs, or even other countries’ policies. The trade policy might then become part of the scenarios as far as the Environment Ministry is concerned. This is very confusing, and I notice that a lot of people are uncomfortable with including policies as part of scenarios. It seems to me that they prefer their scenarios as pure, roll-the-dice, chance events. Their objection to including policies in scenarios is that, eventually, people decide on policies. They are not chance events. My reply would be that we can only decide on a particular domain, like ballast water treatment policy, or fisheries policy, or MPA allocation. What happens outside that domain is something we cannot influence, so it has to be considered a chance event. But I agree it feels uncomfortable, and the line is difficult to draw.